The other day I was taking a sizzling Gratin Dauphinois out of the oven when a couple of friends asked for the recipe. Jings! I realised I hadn’t even posted the recipe yet. 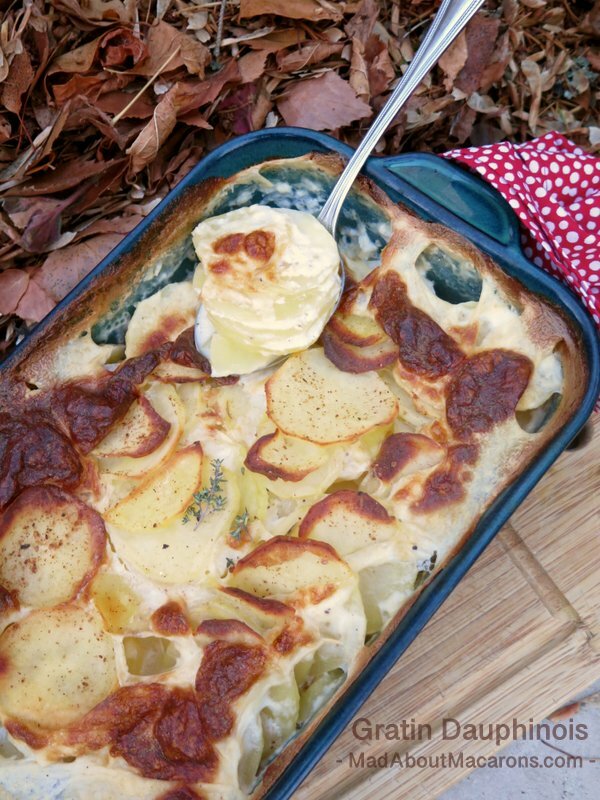 So, without further ado, here is my version of the classic French creamy potato bake, which originates from the Dauphiné region of South-East France. It’s pretty hearty with all that cream and so I don’t make it often. 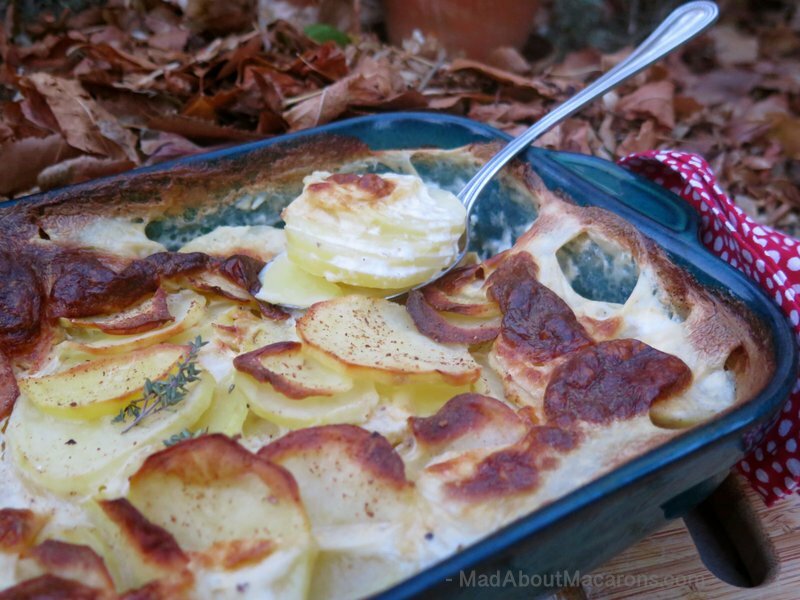 If you love a potato bake without the cream, then you’ll love this delicious Potato Gratin Savoyard recipe, which instead bakes in chicken or vegetable stock and is smothered in plenty of grated cheese which bubbles just as beautifully. Gratin Dauphinois with Cheese or Without Cheese? In general, I personally prefer it without the cheese, as it’s easier to pair with the rest of the meal. If entertaining, it also means that we can still serve a plateau de fromages with French cheeses with a little less of the guilt! The process is very easy. First and foremost, choose a waxy potato variety such as Charlotte, Jersey Royals or Belle de Fontenay, as they keep their shape and have just enough starch to thicken up the creamy sauce as it bakes in the oven. 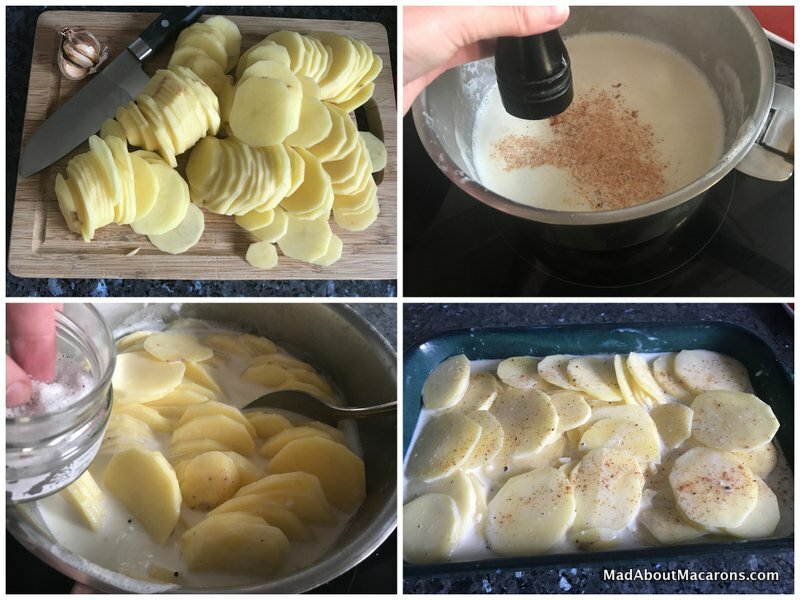 Slice the potatoes and coat them in hot milk and cream, nutmeg and seasoning, throw into a greased baking dish and bake. 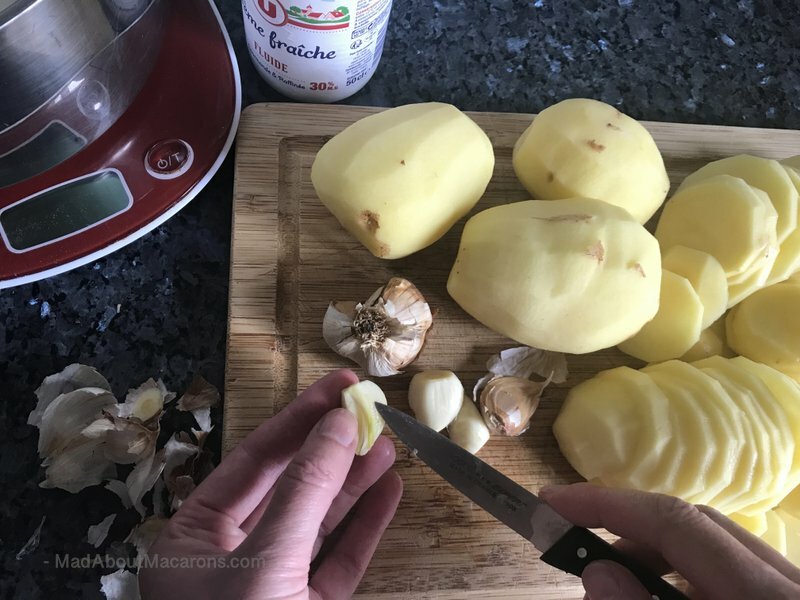 I often make this in advance earlier in the day if making for dinner guests – it takes the stress out of the meal preparation when you can reheat in about 15-20 minutes! When I say seasoning, why not add a special touch of truffle salt? It gives a subtle background of earthy festive luxury. Normally a Gratin Dauphinois is served as a side-dish; I love to serve it with roasted chicken or pan-fried chicken I’ve rolled in thin slices of smoked bacon (poitrine fumé). However, it’s also great on its own as a light supper and ideal for vegetarians. Easy recipe for the French classic, Gratin Dauphinois. Enjoy this creamy, hearty side-dish which doesn't necessarily contain any cheese (ideal for vegetarians) but if you prefer a sprinkling on top, be my guest. Preheat oven to 190°C/170°C fan/ 375°F/Gas 5. Peel the potatoes, wash and pat dry on kitchen paper. Slice them as thin as you can (3mm) either by hand (like I've done here) or with a mandoline (watch your fingers!) or the slicer attachment of a food processor. Heat the milk, cream and chopped garlic (depending how much you like your garlic!) in a medium saucepan (able to hold all the potatoes) until boiling. Turn down the heat to low, add the nutmeg, salt and pepper (a few turns of the pepper mill) then add the sliced potatoes (no need to wash, as you need the starch to thicken when it bakes). Cook for about 5 minutes, turning the slices over with a spoon so that the potatoes are well covered and heated in the cream. (If you prefer to add cheese, add it here). If making for guests, prepare 2-3 hours in advance and reheat covered in foil for 15 minutes before serving to make life easier. Nutritional Values: 210 Calories per serving (without the cheese); 5g protein; 9g carbohydrates; 27g fat. Matching wines: As this is a side-dish, it all depends on what you're eating with it but since it's a real winter warming dish I'd go for a gutsy, oily white such as a Chardonnay, Voignier or Chenin Blanc and for a red, a good Burgundy (Pinot Noir) or Beaujolais Cru such as Morgon. 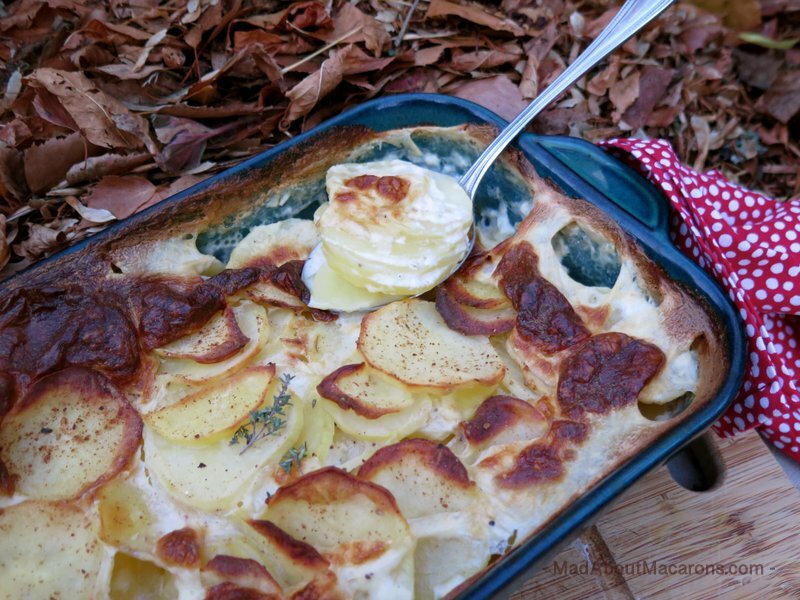 Have you made any of the recipes from le blog, my books, or fancy making this Gratin Dauphinois? Please leave a comment below or why not take a picture and hashtag it #MadAboutMacarons on Instagram or Facebook? Even better, why not just tell your friends and family about the blog? Thanks for popping in. Next time I have friends over we will have roast chicken with Gratin Dauphinois especially when it only takes 15 minutes to prepare. I love the idea of adding bacon. You’ll love it! As you can see, it’s super easy and a real crowd pleaser. Please remind me to tell me my Gratin Dauphinois story when I speak to you next time! You’ll never believe it. I’m still in disbelief. Yours look absolutely delicious! Makes me want some right now! Hehe. Now I’m in suspense … dying to catch up soon! I love some cheese on this beautiful dish! We love both versions – cheese is fabulous too, depending on what you’re having with it or if you’re serving it on its own with a salad. I’m thinking this is definitely going to be on my Thanksgiving table!! Thanks so much Jill. This will be special and a new tradition. Well that’s wonderful to hear, Bea. Thrilled to hear I’m indirectly at your Thanksgiving table. Cheers!